Note: This is generally considered to be sub-sonic ammunition because of the heavy bullet weight. Since the 1860, Americans have trusted Winchester and its owner Olin Corp. for producing quality ammunition and firearms. Today, Olin/Winchester provides billions of rounds of ammunition annually to military, police, shooters and hunters across the world. 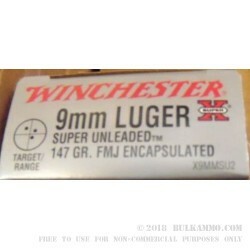 The Winchester Brand is one of America’s oldest brand of ammunition still in production. This Winchester 125 grain jacketed soft point is ideal for .357 revolver owners for self-defense, and training. 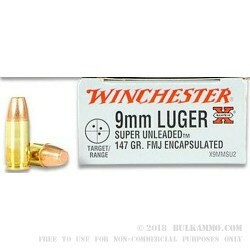 This 357 magnum ammunition features a jacketed lead soft point to reduce exposure to lead and provide excellent expansion upon impact with a target. This ammunition is brass cased, and boxer primed. Ammunition is fully reloadable. 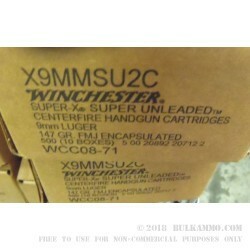 When you purchase this ammo, you’ll get a single box with 50 rounds inside ready to load and fire.